CH Off the Hook Bulldogges Crush the Olde English Bulldogge at 3 years old—"Crush is a beautiful specimen of the Olde English Bulldogge. He is a conformation champion in two organizations." 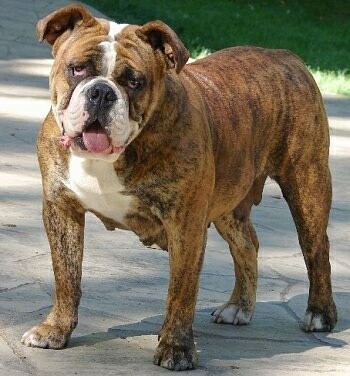 The Olde English Bulldogge is a muscular, medium sized dog of great strength, stability and athleticism. He is well balanced and proportioned, with no features exaggerated or standing out. He has the appearance of a dog capable of doing his original job, bull baiting. The OEB head is prominent and dramatic. The circumference of the head is at least equal to the dog’s height at the withers. The cheeks are large, well developed and display powerful jaw muscles. A slightly wrinkled forehead is acceptable. The skull is large but well-proportioned to the dog’s muscular body and prominent shoulders. There is a crease from the stop to the occiput. It has a narrow skull and domed forehead. The muzzle is square, wide and deep, with definite layback. Distance from the tip of the nose to the stop does not exceed one-third of the distance from the tip of the nose to the occiput. Height of the muzzle from the bottom of the chin to the top of the muzzle is equal to or greater than the length of the muzzle, thus producing the deep, square muzzle. There is slight to moderate wrinkle on the muzzle. Flews are semi-pendulous. The bite is undershot and horizontally straight. Underbite is ¾” or less. Lower jawbone is moderately curved from front to back. Eyes are round to almond-shape and medium sized. They are set wide apart, with the outside corner of the eye intersecting with the outside line of the skull and are set low, at the level of the muzzle, where the stop and muzzle intersect. Eye color is brown, with black pigmented eye rims. Canine teeth are large. Broken, chipped or extracted teeth are acceptable. There are 6 corn row teeth between canines. Nostrils are wide with a line running vertically between nostrils from the tip of nose down to the bottom of the upper lip. Nose is large and broad in relationship to the width of the muzzle. Nose color is black. Ears are rose, button or tulip, with rose preferred. They are set high and to the rear of the skull. The ears are positioned as wide as possible on the outside of the skull. They are small to medium in size. Neck is medium length, wide, and slightly arched. It is a little smaller than the head where the two meet, and gets wider from that point to the shoulders. It is slightly loose from jaw to chest, forming a double dewlap. They are broad, heavily muscled and have a separation between shoulder blades. The scapula (shoulder blade) should be at an approximate 35-degree angle to vertical and form an angle approximately 110 degrees to the humerus (forearm). Scapula and humerus should be roughly equal in length. A vertical line drawn from the point of the scapula (top) to the ground will pass directly through the elbow. The elbows are not turned in or out. The legs are set wide apart, coming straight down from the shoulders. They are straight vertically on inside of legs and well-muscled, giving a bowed appearance of front quarters. The forelegs have medium bone and are in proportion to the body. The pasterns are medium in length. They are straight, strong, flexible and nearly perpendicular to the ground. Body is sturdy and powerful. The length from tip of breastbone to rear thigh is slightly longer than the height from ground to withers. The back is wide and muscular, showing power. Topline has a slight roach (or wheel) back. There is a fall in the back, to its low spot behind the shoulders. From this point the spine rises to the loin. The high point of the loin is a little bit higher than the shoulders then there is a gentle curve, forming an arch, down to the tail. Loin (back of ribcage to hips) is muscular, medium in length and slightly arched. The chest is wide and deep with a muscular brisket. Ribs are well sprung and rounded, being at their fullest directly behind the shoulders. Shoulders to forelegs are well muscled. Hips and thighs are strong and muscular. Hind legs are well muscled and slightly longer than the forelegs. In a natural stance they are straight, parallel and set apart when viewed from the rear. Distance between hind legs is less than distance between front legs. Angulation is moderate. Stifles have a gentle convex curve when viewed from the side. Stifle angle roughly matches the angle of the pelvis. Hocks are perpendicular to the ground when viewed from the side and back. They are parallel to each other when viewed from the back. A line drawn from the rear-most part of the buttocks, perpendicular to the ground, should fall to the front of the toes. A line drawn from the upper (front) point of the pelvis, perpendicular to the ground, should pass through the knee (the two preceding tests of good angulation must be performed with the dog’s hocks set perpendicular to the ground). Feet are of medium size and are well arched and rounded (cats’ foot). They are straight when viewed from the front. Rear feet are smaller than front feet. Tail should be set low and tapering from base to end. It can be pump handle or straight, with pump handle being preferred. Tail should reach the hocks or be slightly shorter. Tail is carried down, horizontal or high. Coat is short, close and of medium density. It should be shiny, showing good health. Color can be brindle of red, gray, fawn or black; either solid or pied (with white). Solid white, fawn, red or black; solid color or pied. May be susceptible to bloat—a painful and often fatal condition that can be brought on by too large a quantity of food consumed at one time. As with all large breeds, hip dysplasia sometimes occurs. 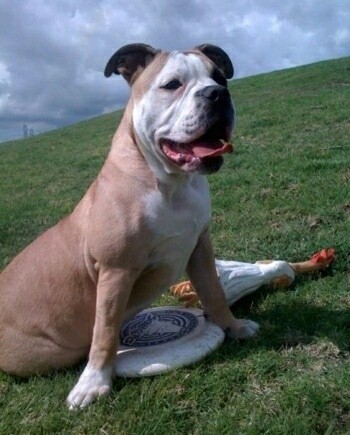 Breeders are working hard to keep it out of the Olde English Bulldogge; therefore, no dog with bad hips is bred. Olde English Bulldogges will adapt to almost any lifestyle. They should be protected from the extreme cold and heat, although they are not as susceptible as the AKC Bulldog. About 11 years or more. 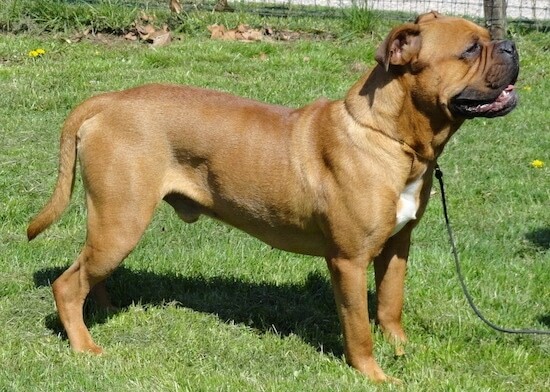 The Olde English Bulldogge is a rare breed developed by David Leavitt by the crossing of half English Bulldog, and the other half: Bullmastiff, Pit Bull and American Bulldog. In 1971 he became disenchanted with English Bulldogs due to their breeding and breathing problems. He discovered that they didn’t look like their ancestors who were healthier and less extreme. 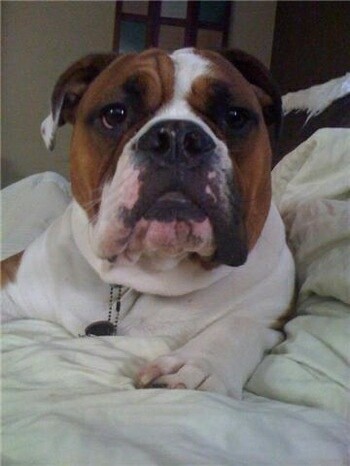 David's goal was to produce a dog with the looks of the 18th century bulldog, with the temperament of today's English Bulldogs, yet healthy, without breathing problems, or all the other aliments today's English Bulldogs are prone to. This new breed can now breathe. They will never be like hounds, able to run for miles during the hottest weather of summer, but they’re three times better than the restricted modern Bulldog. Cesarean section births are not necessary. Artificial insemination, due to male ineptness and lack of drive, has been replaced by natural ties. Lifespan is over eleven years. All breeding stock has had hip x-rays. No dog with bad hips is bred. David says he is now achieving his goal of producing a Bulldog with the health and temperament to be able to serve people, instead of forcing people to serve him. David Leavitt is breeding them to more of a working lines type dog, while OEBKC is breeding the dogs as more of a family oriented dog. 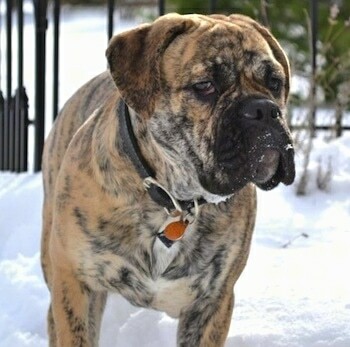 Some lines of the Olde English Bulldogge (OEB) renamed their dogs in 2005 to the Leavitt Bulldog to separate their dogs from some of the other OEB lines that did not meet their standards. 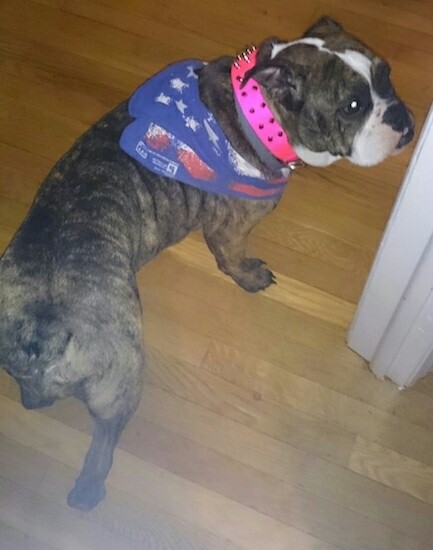 Founder David Leavitt states "A big reason for my wanting to change the Breed name is that there are far more Alternative Bulldog OEB’s than true ones, and most of these dogs don’t have the appearance of the old working Bulldog. I admit it’s my pride that has driven me to want to make clear these heavy dogs aren’t my creation. I couldn’t force them to change and the logical answer was to change a name that really wasn’t correct for the period we are trying to recreate anyway." 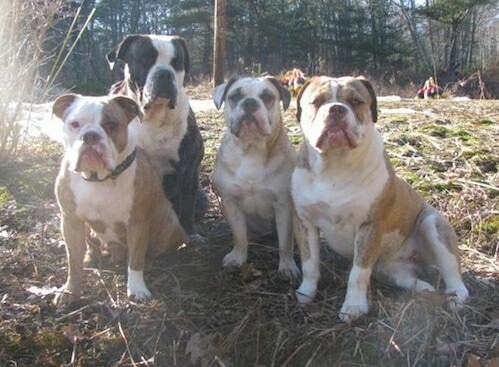 "Here's a picture of all the Olde English Bulldogges that live here with me and my family here at Wicked Good Bulldogges. From left to right: MidWest's Fancy Nancy, Rhino Tuff's Grimm Reaper, MidWest's Damariscove Dhara CGC, and Anderson's Suzie of Seguin. They range from ages 3.5 years-9 months old. They are easy to train and listen well (most of the time) like any dog. They thrive on puppy classes at an early age and need positive training and work great with clicker training. It's important to socialize with other dogs at an early age." Indie the Olde English Bulldogge born in the 1990s from the original David Leavitt lines—Indie and Neely (shown above) are littermates. Indie celebrated her 16th birthday in August! Zelda the Olde English Bulldogge at 1 year old—"This is Zelda. Zelda is very affectionate and playful. She loves making new friends of all ages and sizes. When not out playing or going on a stroll she spends most of her time zonked out on the couch or playing with her favorite toys." 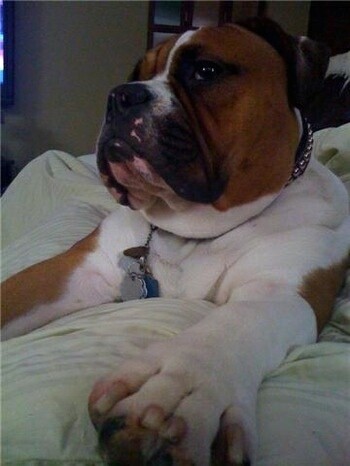 "My man Willie is your typical Olde English Bulldogge. 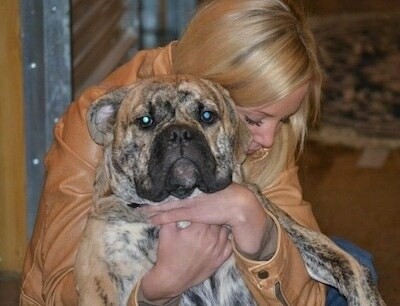 Purchased from Nunley Ranch Bulldogges in August 2010, he is everything an Olde English Bulldogge should be. He loves everything in this world that a dog should love: Other dogs, cats, animals, playing fetch, swimming, playing with kids (gently, of course), and protecting his house. This is Willie at 7 months old in Chicago after a snowstorm. 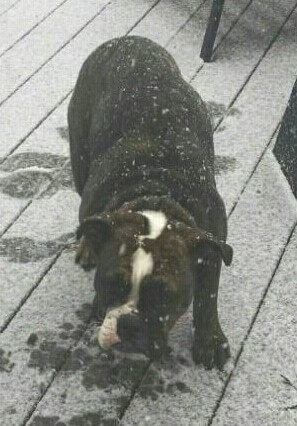 Willie loved his first snow experience." "This is Willie at 6 months old while hiking in East Tennessee." "This is Willie at 8 months old with my girlfriend (who he thinks is his girlfriend)." 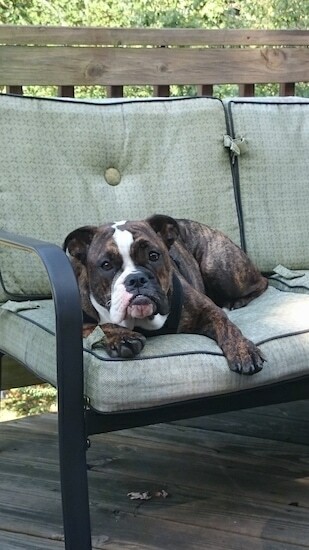 Lola the Olde English Bulldogge at 1½ years old—"In this picture she is at her "post" getting ready to bark at anyone who gets too close to the house. Not that she would do anything; she is just an all-around friendly dog and loves everyone. She's such a joy and a wonderful part of our family. She loves to romp with other dogs and is great with children." 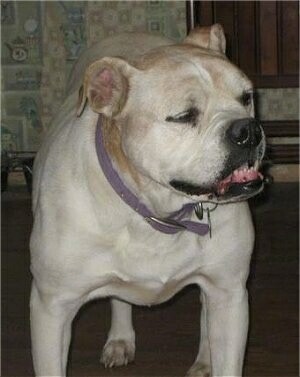 "This is Boss, registered as an Olde English Bulldogge. His father’s name was Kyser Odie of Midwest Kennels. Boss is short for Jaws Bossodie, after his father. In this picture he is 5 months and weighs 55 lbs. He is full of energy, affection and love. His disposition is generally obedient and very smart. He loves chasing birds, catching Frisbees and socializing with other dogs. Boss has a strong personality and if he is ignored, he will let you know. He is an amazing companion and constantly catching people’s interest with his looks and personality." 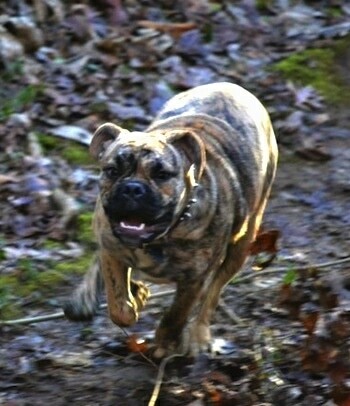 "Here is my Olde English Bulldogge Gibson from ElkValleyBulldogges in TN. He is one year old in this picture, and 65 lbs. His temperament is lovable and always predictable. This breed has a "big dog look" but a medium-dog size."